This correspondent is in Canberra for a couple of days doing the whole Questacon, Australian Museum caper during school holidays. With the sprogs safely tucked away, I was able to duck off to one of two microbreweries in our Nation’s capital. 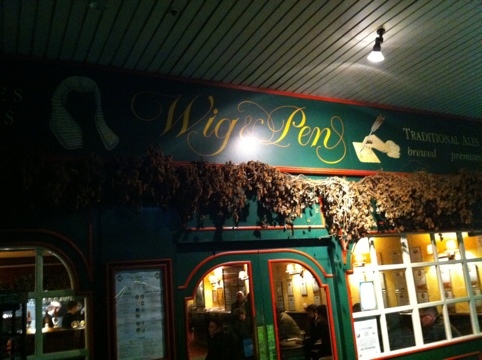 The Wig and Pen has been operating in Canberra for 17 years now and is styled like an old English Pub. Apparently the food is pretty good, but tonight was about the beer. There was no shortage to choose from with 14 beers and 3 ciders on tap. 4 of the beers were on a hand pump in that old English style. First off – Brewers’ IPA. Off the hand pump, smooth, not bitter at first, but a long lingering hop aftertaste. Second – a Pale Ale off the hand pump. Very mild and again smooth. 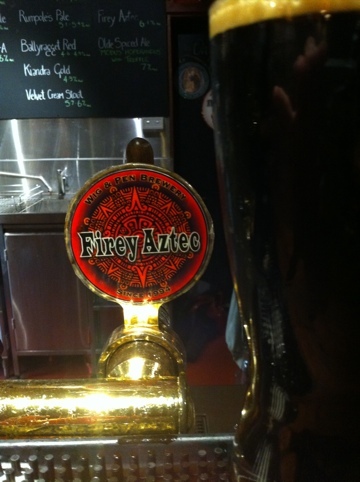 Third – Firey (sic) Aztec. The night’s winner. I approached with trepidation because the last chili beer I tried was simply unpleasant. The surprise here was that the Firey Aztec was a Chili Stout. The chili was used for its flavour not its heat and it worked. Top beer, tasting like a Lindt chili chocolate, though not as sweet. A warming low buzz permeated throughout. A winner. 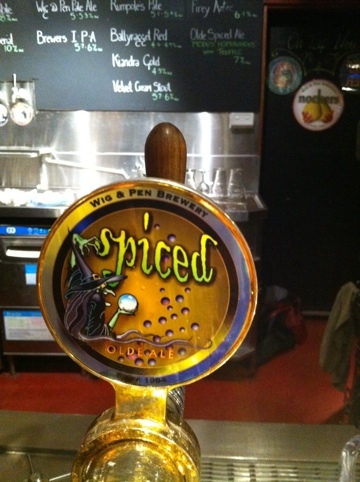 Lastly, I tried an Olde Spiced Ale. This was a dark beer passed through a compote of spiced and fruit. 7% and plenty of flavour. Worthy of a second attempt. Alas, the wind was taken out of our sales by the bar man’s last call at 10pm! Bugger – 10pm! Aaah, yes. It’s Canberra.